The EEZWALKER Bungee Leash is convenient for working, walking, and jogging your dog allowing your hands to be free from holding the leash. I use hands free leashes because the dog learns to walk or run with my gate. The stretch in the bungee leash is a great feature because the give of the leash causes the leash to have smooth movement between the dog and handler. If you are jogging and stop quickly there isn’t a jerk in the leash but time for the dog to have an extra step to stop. Having your hands free makes jogging, pushing a stroller, pushing a grocery cart, opening doors, and loading the dog in and out of vehicles very useful and accessible. 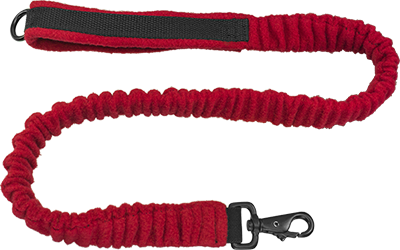 The bungee leash is covered with fleece and features a soft looped handle. The bungee leash can be used separately or attached to the belt snap. The leash length unstretched is 36”. The image with the handler bag is for example purposes only. EEZWalker handler bag sold separately. Fleece covered 1” wide bungee leash.